Here’s another fun and unique spongeball magic trick that will startle and shock your family and friends… I was a naturally shy young man in school, but magic helped me to open up and easily make friends. It was this trick that got me a girl friend when I was in high school :-)… If you’ve been practicing, then you should know how to do this amazingly easy magic trick! Make sure to watch both videos below (click the link under the video to watch the 2nd video). Make everyday objects levitate, spin, and dance. 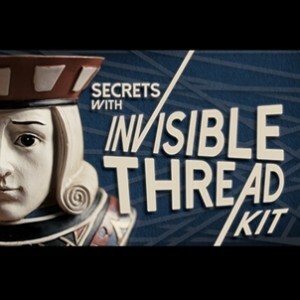 (Gravity is optional) Kit contains invisible thread, magician’s wax, and instructional DVD. Magically cause a spectator’s card to rise right out of the deck. Cause any dollar bill from a spectator to levitate moving your hands around it. Spectator’s will be shocked when you make a card spin through your hands and around your body. Effortlessly levitate a cork from the top of a bottle to the palm of your hand. Control a pen from any container to your hand without even touching it. Make a ring rise, float, and spin in mid air. Cause objects to float above what seems to be an invisible bridge above a single card. Amaze everyone when you make a bottle cap spin like a flying saucer. Without even touching the deck, mysteriously cut a pack of cards in half, and watch as only one card swings out. Yeah prettey coll although I performe it before very good explamation but you should do somthin on stage allusions. great! when is new one coming? Wow that easy!! thx mr.Cartess Ross you got skills! This is an amazing trick but when are you going to send the next one because it has alnost been two weeks now? Is there something wrong? I just want to say that what I got from the teacher of magic…its really AMAZING fantastic and I really liked it and also want to know more….and more. Catess….this is wonderful.I love it. I want to a new one but it doesn’t come .s could you send it for me? I love your magic but why no more lessons after sending two lessons? awesome dude! was wonderin if i would get the lit cigarette into the dollar bill trick sent to me?? its unreal! !